LaGuardia Airport was dedicated on October 15, 1939 as the New York Municipal Airport, and opened for business on December 2 of that year. It was built on the site of the old Gala Amusement Park at a cost of $40 million. This aerial photograph was taken within a couple months of when LaGuardia first opened since it appeared in the March 1940 issue of Boys' Life magazine. The Google map satellite view is below the page scan, and I superimposed the 1940 runways and taxiways on top of it for comparison. You can see where expansions were built into the water to accommodate longer runways. 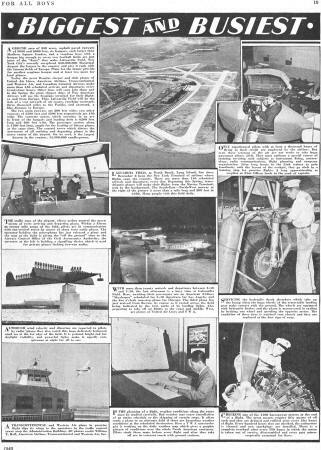 A Ground area of 558 acres, asphalt paved runways of 5,000 and 6,000 feet, six hangars, each larger than Madison Square Garden, and a seaplane base with a hangar big enough to cover two football fields are just some of the "firsts" that make LaGuardia Field, New York City's recently completed $50,000,000 Municipal Airport the largest in the country and give it rank with the famous fields of Europe. Plans for the future provide for another seaplane hangar and at least two more for land planes. 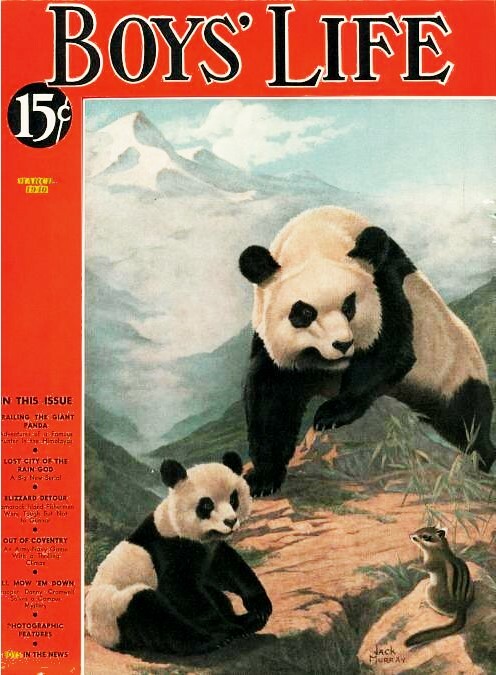 Today, the great Douglas sleeper and club planes of United Air Lines, American Airlines, Transcontinental and Western Air, and Canadian Colonial Airways make more than 140 scheduled arrivals and departures every twenty-four hours. Other lines will soon join them and in the Spring the giant clipper ships of Pan American Airways will use the Seaplane terminal for their flights to and from Europe. 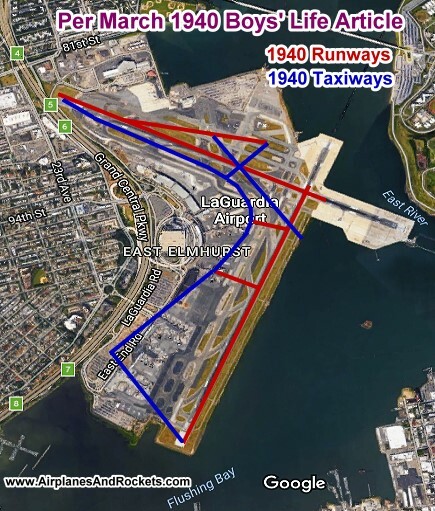 Thus LaGuardia Field will be the hub of a vast network of air routes, reaching westward, three thousand miles to the Pacific, and eastward, a like distance to Europe. The two main runways are 200 feet wide; two other runways of 3,500 feet and 4,500 feet respectively are 150 wide. The concrete apron, which stretches in an arc in front of the hangars and loading deck is 6,200 feet long and 400 feet wide. The passenger section alone is 1,500 feet long, ample for the loading of fifteen planes at the same time. The control tower which directs the movement of all arriving and departing planes is the nerve center of the airport. On its roof, is the largest beacon in the country, 13,500,000 candle-power. In the planning of a flight, weather conditions along the route must be studied carefully. Bad weather may cause cancellation of an entire schedule or the skipping of certain stops. It often sends a plane to an alternate field if there are hazardous weather conditions at the scheduled destination. Her-e a TWA meteorologist is working on the daily weather map which gives a graphic picture of conditions over the whole North American continent. Pilots study these maps before every flight and after they take off are in constant touch with ground stations.